The Dynaplug Micro Pro is crafted for the scale of a puncture repair in a tubeless bicycle tire. The reduced force needed to repair a bicycle tire resulted in this ergonomic, compact repair tool with extreme durability and efficiency. 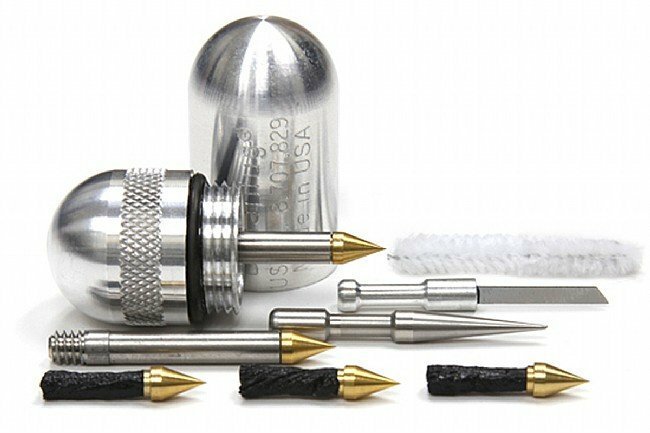 This expands Dynaplug into the area of UST tires and tires converted from tube-type “bike rim and tire” with a Stan's Tubeless Conversion Kit. Very compact and lightweight yet complete. Haven't had to use it yet but it looks like it will do the job. Saved me $80 for a new tire! Compact, It works! a little heavy, a plastic case would work, but it is very, very well made!